The quickest way to hurt the value of your cards is for them to become damaged...and that's why card sleeves and holders are essential. We've all heard horror stories of old collections that were handled and played with to the point that their surfaces, edges and corners became worn. You'd be surprised at just how much a ding here or there can change a card from being one of the most valuable to just run-of-the-mill. So, it's crucial that you become knowledgeable about the different options to secure them. And in this guide we go over the best options for protecting your collection. 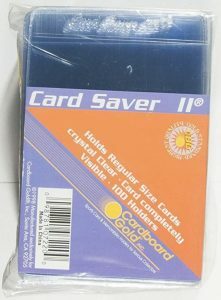 Card savers are clear, semi-rigid plastic sleeves and are the most popular type of holder used by collectors and dealers. Their flexible plastic bodies ensure that your cards don't slip and slide around while still offering great protection from the outside. Their 1/2" upper lips make it very simple to insert and remove cards from them. These two reasons are why grading companies like PSA recommend you use these card savers when submitting cards for grading. They do come in various sizes, so you'll want to be sure you pick the right card saver for your cards. Click here to check pricing on Amazon. These are the most common type of card saver that you’ll want to use for the majority your cards because of their dimensions. They are great for holding standard size cards from 1952 onward. You can also use them for many pre-War issues like Goudey, Cracker Jack and U.S. Caramel. I will typically use these for pre-War tobacco and candy cards. You can probably get away with using Card Saver 1’s for them but I’m too paranoid that they’ll slip around in those. So, for me, these have been a great option to secure cards that are smaller than the standard size. If you collect tallboy football and basketball cards from the 1960’s and 1970’s then these are right up your alley. Cards from that era had some of the most unusual dimensions but luckily these will do the job. You can also use the Card Saver 4’s for these kinds of cards but personally I prefer these. Card Saver 4’s are great for oversized cards like the old Exhibit cards or many other regional food issues that were produced in odd sizes. I would definitely not recommend using these for standard-sized cards–go with the Card Saver 1’s for those. But, if you’re going to store or submit for grading any kind of large card at all, then consider these as your best option. One of the most basic but important type of card sleeves are “soft” or “penny” sleeves. They are an acid free, archival quality product made of crystal clear polypropylene that are essential in protecting the surfaces of your cards. Personally, I like to use these in combination with the card savers mentioned above. The penny sleeve will protect it from dirt and grime every time you pull it out and the card saver will keep it securely in place. This is the best way to submit cards for professional grading. If you like to collect sets or even many cards of the same player then these are made for you. You load the cards from the tops of each pocket and the three punched holes along the side make them easier to put into a 3-ring binder. These are probably the best way to store and display entire sets as it’s fun to flip through card by card through an entire series. And, like I said, if you have a ton of cards of a favorite player then this is also a great way to show them off. For maximum protection of your cards, top loaders are the most durable to store your cards. The downside to them is that cards can sometimes shift around easily within them. One idea to help prevent this is to place your card in a soft sleeve first and then into the top loader. I would personally never ship cards in top loaders due to the risk of them sliding around but if you are going to keep your cards around the home, they can be a great option. They do also come in different “point” or thicknesses so that they can accommodate some of the thicker modern cards that contain pieces of game used memorabilia or uniform patches. Similar to top loaders, these “screw down” holders are another great way to add more protection for your cards. They’re made of high impact, crystal clear polystyrene and have a rectangular area in the middle part of the case that is “recessed” where the card fits. Be careful when tightening the screws as the threads are fragile and you can easily over-tighten and damage the casing. There are several types of screw-down holders but these single-screw designs are probably the most common. Stay away from any screw-down holder that does not have the recessed area to fit the card because you can over-tighten the screws and squish the card.